This post comes from some thinking I have been doing (for quite some time, in fact, though perhaps not with the rigor I should have) in response to two posts by Romeo Kodra, on the blog AKS Revista. In essence, both posts concern the appropriateness of the use of the adjective “communist” to describe the period between 1944/45 and 1991 in Albania. The posts in question, “Albanian Lapidar Survey: Lehtёsia e papёrballueshme e pёrdorimit tё konceptit ‘komunist’” and “Communism Never Happened … edhe nё Shqipёri,” argue that there is something both wrong and more than slightly insidious in describing the culture of socialist Albania as “communist.” The particular context that Kodra singles out for critique is the publicity and terminology of the Albanian Lapidar Survey, conducted by Departamenti i Shqiponjave and recently documented in the three-volume catalogue Lapidari. Given that I am a contributor to the catalogue, and that I am one of those singled out for critique in Kodra’s second post—since I use terms such as “communist regime,” “communist art,” and “communist state,” among others, in my essay in the catalogue—I would like to offer a defense of my thinking vis-à-vis my use of the term. I certainly cannot presume to speak for the other authors represented in the Lapidari catalogue, nor for Departamenti i Shqiponjave, and it may be that others’ reasons for using the term “communist” (perhaps ‘lightly,’ perhaps not) are quite different from my own. Two things bear saying: first, this post is meant in the spirit of dialogue—I am quite willing to entertain and be convinced by counterarguments, but I think there is a certain justification to my use of “communist” as an adjective in the contexts for which I am chastised for using it; and second: I realize that this response might come entirely too late. It has been several weeks since the second of Kodra’s posts, and more than half a year since his first critique. I can only say that thought on some issues takes time to unfold, and I hope that the delay is not taken as a sign that I do not value the critique presented by Kodra’s writings—quite the opposite. I also apologize for not responding in Albanian, although I honestly feel that my knowledge of the language would not permit me to respond as fully as I wish to do; the hypocrisy inherent in such an excuse is acknowledged, and I bear the weight of it. Allow me to set aside the characterization of the European Union as a “normal, democratic” world—as an American, my opinion on this matter is of little import regardless, since I have no pertinent experience living in the EU—and say that I am quite in agreement with Kodra’s critique. 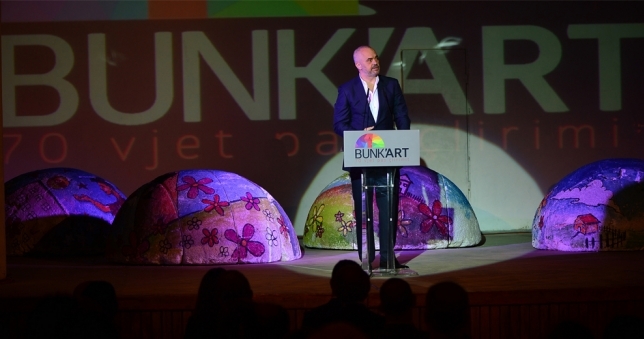 I do often hear the term communism demonized in an entirely polemical way in Albania (though this is perhaps as much as result of the move towards the EU as not), and I would like to avoid using the term in the way that it is used, say, by the organizers of exhibitions like Bunk’Art or Shtëpia e Gjetheve [House of Leaves]. (These latter two museums are also singled out in Kodra’s second post for their misuse of a rhetoric on “communism.”) It is entirely true that there is a sensationalism surrounding the term that cannot be avoided—though this does not mean that it cannot be engaged through the use of the term in less sensationalist ways. Kodra seems concerned that the use of the term “communist” (or “communism,” which I think are two actually quite different things, but perhaps in Albanian this is not true) obscures “the simple fact that communist Albania never existed” [“faktin e thjeshtё sepse Shqipёria komuniste nuk ka ekzistuar asnjёherё“]. Perhaps it does. Nonetheless, I would like to ask (either Kodra or anyone in deep agreement on the issue): what are the alternatives? One obvious term/concept that suggests itself is “socialist,” the term most often used by the regime itself to describe Albania’s condition ca.1944-1991. In fact, in my writing, I have often attempted to limit myself to the use of the term ‘socialist’ in place of ‘communist,’ for precisely this reason. However, I find myself equally unsatisfied with this term: it ultimately preserves nearly all the vagueness and—at least in America—many of the potentially negative and sensationalist connotations. However, at the level of usage by the Albanian 1944-1991 regime, it at least has greater historical accuracy, and perhaps that is the reason it should be used. Another possibility is “Marxist-Leninist,” which I find dissatisfying because it seems to simply link a more specific context (Albania in the years of Hoxha’s leadership and immediately afterwards) to a very general set of philosophical principles that were taken up and applied in numerous contexts—but then, so was “communism,” and I have used that term. So perhaps Marxist-Leninist is the answer. However, it seems to me that it would take some heavy discursive work for “Marxist-Leninist Albania” to become a term that a broad audience could conceptualize…but perhaps the work should be done by those of us who write on this period. Along similar lines, the term “Enverist” (or “enverist”) could be used. This would acknowledge the specificity of Hoxha’s version of Marxism-Leninism-Stalinism-Maoism (the list could go on, of course). This seems to be one option Kodra would prefer, since he uses the term “Albanian Enverism” in his second post. However, I protest this term on the grounds that it treats the collective manifestations of culture and politics (I am interested specifically in culture, but of course they cannot be separated) of Albania 1944-1991 (or 1944-1985?) as solely the product of Enver Hoxha in some essential way. This to me seems equally sensationalist. Kodra clearly wants to divide the negative associations of Enver Hoxha’s regime from the term “communism”, but this seems to me to simply transfer any negativity to the construct “Enver Hoxha,” as if he was the sole actor and bestower of meaning in “communist” Albania. Yes, I would like to preserve the potential of communism as a way of acting, believing, thinking, and living that is quite separate from Enver Hoxha’s method of cultural and political existence. However, I think this is done not by using alternative terms/concepts, but simply by acknowledging that the term “communism” (or “communist”) does not have a single hard and fast meaning. It most certainly does not always mean that the reference is to “actually existing communism.” I think I can say, of myself, that I have never used the term “communist” to imply that something (a sculpture, a painting, a regime, a dictator) corresponded completely with the concrete actuality of a communist reality. And this is precisely because I do not believe “communist” reality (or even “socialist” reality, but this is a separate conversation I am happy to have with Kodra or anyone who desires) to be something that appears concretely in the world in an empirically verifiable way. Quite the opposite. To put it plainly: I regard all “communist” discourse as utopian, which is to say I regard it as taking up an attitude towards the world that posits an impossible endpoint that one nonetheless comports oneself towards. I realize that some (indeed, many) believe that communism is something that could be ‘realized’ in a way that would not merely be representational or utopic. I politely disagree, and I stake my use of the concept “communist” on this. When I have used the term “communist” to describe art or politics relating to the creation of art in Albania 1944-1991 (for this is the field I study), I mean that this is an art, a politics, a regime, a culture that takes up a particular attitude towards a utopian future reality of “communism”—a future that is never realized. Communism is not a (and was not) a condition that ‘actually existed’ and made the things ‘within’ it “communist”; rather, “communism” as a horizon makes certain things “communist.” I hope that this at least clarifies my use of the term, and the futural quality of the Albanian art and culture I have used it to describe. In his speech “Shkrimtarët dhe Artistët Janë Ndihmës të Partisë për Edukimin Komunist e Njerëzve Tanë” [“Writers and Artists Help the Party to Achieve the Communist Education of Our People”], delivered in December of 1974 at the Secretariat of the Central Committee of the People’s Republic of Albania, Enver Hoxha stated that “Marxism-Leninism leads the people [of the world] towards the new life, towards socialism, and towards communism.” This forward-directedness, the motion towards an unachievable utopia that nonetheless stands as the final term in any list of social transformations, is the meaning I intend to capture with my use of the term “communist.” Perhaps it is not the right word, but it seems at least as appropriate as the others I have considered here. I hope that this post makes clear my use of the term “communist” to both my readers and to Romeo Kodra. I thank him again for raising the issue—and pressing it—and welcome a discussion from any and all parties about the way we might treat the valences of the term “communist” in a way that respects the weight of responsibility associated with that use—and does not simply linger in sensationalism. It is perhaps enough to say that I do not know why the EU should be the standard for ‘normal,’ not am I clear on why exactly it should be exalted as a place where “communism” is not sensationalized as a term. One could, of course, say that Hoxha’s regime never legitimately aimed at this utopic future horizon of communism…but this is to ignore the regime’s rhetoric, and I would argue that that very rhetoric created a reality that—at least in part—unavoidably looked to a utopic communist future. Hoxha, Mbi Letërsinë dhe Artin (Tiranë: 8 Nëntori, 1977), 476. This is the third in a series of posts containing PDFs of texts that may be of interest to those studying Albanian socialist realism (and 20th-century art in general, because socialist realism is some of the 20th century’s most intriguing art). Initially I had planned to write thorough descriptions and analyses of the content of the documents, but I barely have the time to scan them, much less write extensive commentaries. …I promise the next post will actually be an analysis of something.